On 7 November, Dr Owens Wiwa will launch the book Silence Would Be Treason: Last Writings of Ken Saro-Wiwa in the Library at NUI Maynooth at 12.30pm. He will be introduced by Chair of the NUI Maynooth Governing Authority Baroness Nuala O’Loan. 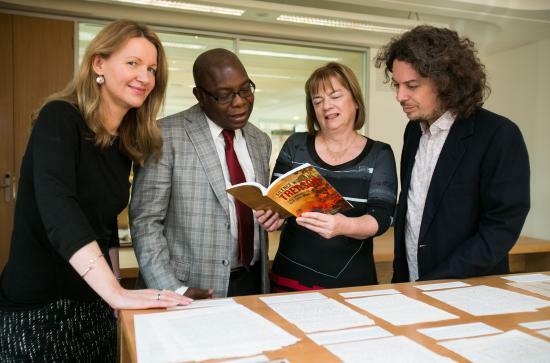 The Ken Saro-Wiwa Audio-Archive, created by NUI Maynooth Library and Kairos Communications, a joint initiative between the Library and Kairos Communications, will also be launched at this event. Dr Wiwa is Regional Director (West Africa) of the Clinton Health Access Initiative (CHAI), a nonprofit organisation committed to providing access to care and treatment for HIV/AIDS. He is the brother of executed Nigerian writer and environmental campaigner Ken Saro-Wiwa. 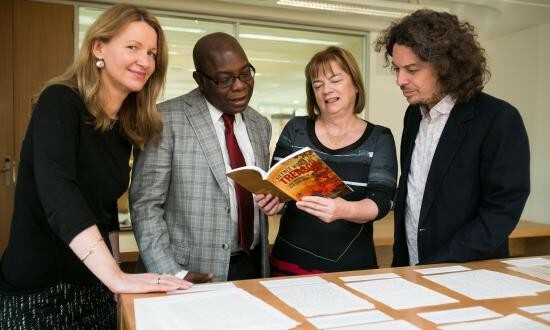 In 2011, Sister Majella McCarron (OLA) donated death row letters and poems she received from Ken Saro-Wiwa to NUI Maynooth and they formed the basis of this book. Edited by three NUI Maynooth staff, Dr. Íde Corley (English Department), Helen Fallon (Library) and Dr. Laurence Cox (Sociology Department), the volume has already received high praise internationally. For more click here.